Genuine OEM Xerox Drum Unit, 100,000 page yield. Xerox part number: 113R00776. Drum Unit compatible with Xerox WorkCentre 4265. Genuine OEM Xerox Toner Cartridge, Black, High Capacity 25,000 page yield. Xerox part number: 106R02734. 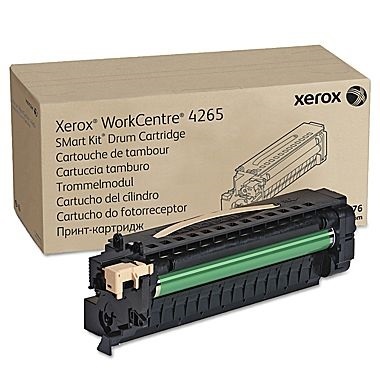 Laser Toner Cartridge compatible with Xerox WorkCentre 4265. Genuine OEM Xerox Toner Cartridge, Black, 10,000 page yield. Xerox part number: 106R03104. Laser Toner Cartridge compatible with Xerox WorkCentre 4265. Genuine OEM Xerox Toner Cartridge Multipack, Extra High capacity 50,000 page yield. Multipack includes: two Black toner cartridges. Xerox part number: 106R03102. Color Laser Toner Cartridge compatible with Xerox WorkCentre 4265. Qualifies for free shipping & earn 544 points! Genuine OEM Xerox Maintenance Kit, 250,000 page yield. Xerox part number: 115R00086. Maintenance Kit compatible with Xerox WorkCentre 4265.